Large deposits of Moonstone are found in India. A gem which relates to the cycles of the moon. We are aware that the moon has the magnetic force to regulate the ocean's tides. That same force regulates the human tides due to the body's high water content (70 - 99.9%). Women's bodies are designed on a 28-day cycle, though not as obvious, men are affected as well. 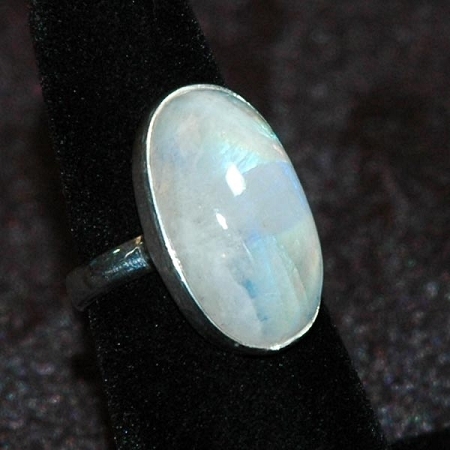 To honor the natural design and "allow what is to be" is the wisdom which dwells in the moonstone. Relax and go with the flow, choose the path of less resistance and recognize the wisdom in surrender. Allow nature to do her thing; let it have you. Can be rainbow (blue/violet), peach, traditional white, and occasionally black.